I’ve been using Facebook for months now and I think i’ve kinda got to grips with it and all its little gizmos and add‐ons. Today I set up a page for the Underground Comedy Club. I was housing it under the Dan Tambling Comedy page, though I feel they have become two different animals and need their own space. 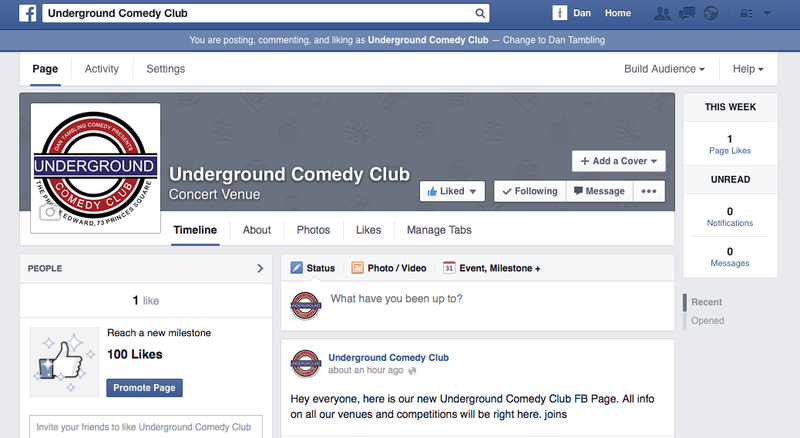 Therefore I proudly pronounce the Underground Comedy Club FB page officially open… yeah. That way I can refer to the event easier on FB and other social media using the link to the Underground Comedy Club instead of Dan Tambling Comedy as the event expands into other areas and venues across London.